Wabash College has received a $22,000 grant from Independent Colleges of Indiana/Ball Brothers Venture Fund to establish a 3D Printing and Fabrication Center (3D-PFC) on campus. The grant will bring together the critical thinking, experimental design, modeling, and data analysis emphasis of STEM-based learning (science, technology, engineering, mathematics) with the creativity, innovative thinking, and effective communication of art and design to create a cross-disciplinary collaboration within the liberal arts. The holistic approach, creating STEAM from STEM and art, incorporates high-impact practices to explore opportunities to infuse this cooperation throughout campus. The 3D-PFC provides infrastructure that will prod faculty and staff to explore diverse and meaningful teaching and learning cross-disciplinary collaborations. First-year seminar courses on design and fabrication, collaborative bridge courses between the arts and sciences, 3D printing and fabrication research internships, and entrepreneurial opportunities with local industry are a few of the approaches that will enable active learning and incubate intellectual and practical problem-solving skills. To further develop such opportunities, the 3D-PFC includes funding to establish competitive mini-grants up to $600 for developing collaborative projects that bridge topics in the arts and sciences for new or newly redesigned courses. These grants will challenge faculty to think beyond traditional content and engage students in newly creative ways, including such faculty-inspired partnerships like theater and physics, computer science and art, and physics and music. The 3D-PFC provides cutting edge technology in support of student internships, entrepreneurial experiences, and undergraduate research collaborations with faculty and staff. This enables students within such programs to work together in tackling problems through available design and fabrication tools. It also provides students with direct experience related to career interests and the supervision of professionals via campus internships and entrepreneurial opportunities. Additionally through this grant, the Wabash Center for Innovation, Business and Entrepreneurship (CIBE) will expand its reach to provide projects for science and art students to collaborate, in conjunction with industry and manufacturing professionals, to work on solving real-world prototype and manufacturing challenges for local businesses using the 3D-PFC. The 3D-PFC collaboration also includes service learning activities to give students direct experience with issues they are studying in the curriculum and ongoing efforts to analyze and solve community-identified problems. A key element in these programs is the opportunity students have to both apply what they are learning in real-world settings and reflect in a classroom setting on their service experiences. Wabash will partner with community, regional, and global health professionals to employ design and fabrication to enrich the lives of children in need of prosthetic devices. Using 3D scanners and printers, customized and inexpensive prosthetic hands can be produced for children in Indiana and across the globe. 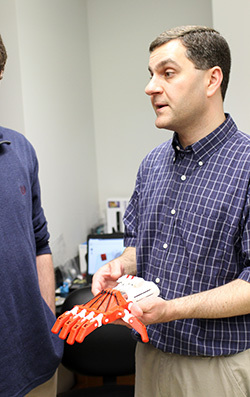 The nonprofit group, Enabling the Future (E-NABLE), has produced several prototype hand designs, and using these models, Dr. Porter and his current students have collaborated to develop a new prosthetic hand design at Wabash. We will expand upon this work by bringing STEAM students together to develop the next generation of prosthetic hands. The goal is to produce devices at no cost to recipients while coordinating with E-NABLE and health professionals to connect with suitable recipients for our devices. Further, the 3D-PFC will work with the Wabash Global Health Initiative to develop devices for children in both Peru and Ecuador, where 3D printing facilities are significantly less available. A sample timeline for the 3D-PFC is as follows: Laboratory space in Hays Science Hall to house the new 3D-PFC will be prepared by late summer. Student interns will be selected and trained by Dr. Porter to serve as campus technicians, competent in the operation of fabrication instruments and training of campus users; and 3D-PFC mini-grant proposals will be solicited, reviewed, and rewarded for Spring 2016 courses in the Fall of 2015. 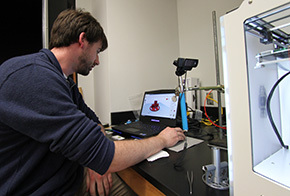 Wabash-funded summer internship applications will be reviewed in the Spring of 2016, while the prosthetic hand project will mature and begin to deliver 3D printed units to children; and student internships will utilize 3D-PFC for faculty-student collaborative research in the Summer 2016. The freshman tutorial, Design, Make, Play: Building All Things Great and Small, will be offered for the first time in the Fall 2016, and dissemination and outreach efforts will follow in the form of workshops, peer-reviewed publications, and national conference presentations. The 3D-PFC grant is the first time the Ball Brothers Venture Fund has funded a Wabash College project.